A medical examiner inspecting the body of a Civil War soldier searches for evidence that will identify the deceased and protect her boyfriend. Though she’s relocated back to her hometown of Trumbull, Pennsylvania, Dr. Gin Sullivan still hasn’t given up her Chicago apartment. The truth is, ever since she came back to town when the body of her long-dead sister was recovered (Dark Road Home, 2016), Gin hasn’t been sure of her next step. Staying with her high school flame–turned–adult boyfriend, Jake Crosby, has gradually morphed into full-blown cohabitation, and Gin isn’t sure either of them is ready for all the baggage of an adult relationship. Her fears are intensified by a fire on a parcel of land Jake’s building on. The fast-moving fire destroys the Archer place, a new home Jake constructed for a nouveau riche out-of-towner, and Gin worries about how much money Jake has wrapped up in the development. Things go from bad to worse when the local police discover a body buried on the site. The corpse is clad in a Civil War uniform, and soon local protestors unite to insist that the land where the soldier was laid to rest not be disturbed. Gin wants Jake to ask her for help, but when he stubbornly refuses to communicate what he needs, she has to guess. As a visiting physician with the medical examiner’s office, she helps inspect the body and begins to suspect that the victim died much more recently than his uniform suggests. But she doesn’t know whether her finding is rooted in fact or whether she’s just seeking a way to keep Jake safe. 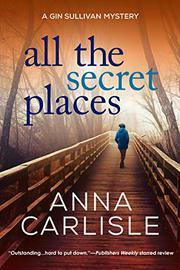 Developing characters introduced in her series debut, Carlisle continues her fascination with small-town secrets.